I’ve never been a big fan of cranberry sauce with my Thanksgiving turkey. I know that puts me in the minority, but it’s just not my thing. That’s, of course, not to say that I don’t enjoy cranberries and cranberry sauce in other ways. And those ways mostly involve dessert. There are so many layers going on here. 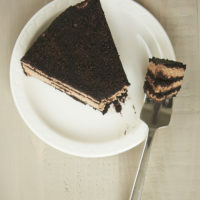 And if you have followed me for a while, you know that makes me so very happy, as I just adore layered desserts. This one starts with a simple buttery crust. That’s followed by a thin layer of cheesecake. Then the cranberry sauce shows up for the party. And it’s all topped with a crumb made from part of the crust mixture. It’s really beautiful in its rustic way. Let’s have some real talk for a minute. The cranberry filling is essentially a homemade cranberry sauce. If you want to skip that step, you can always use your favorite store-bought cranberry sauce. Or, use your favorite homemade variety. Either is fine as long as you feel it will convey well to dessert. 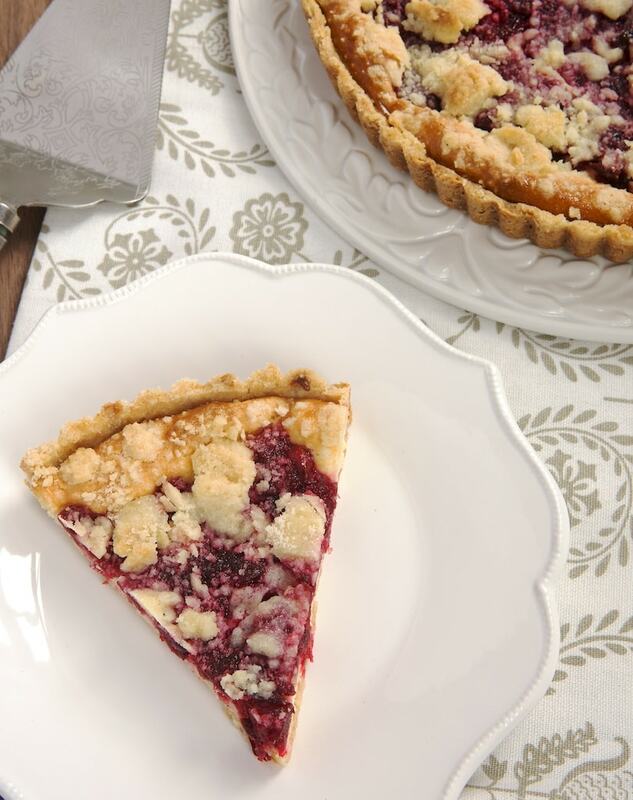 This Cranberry Cheesecake Pie is a great addition to your Thanksgiving dessert table. 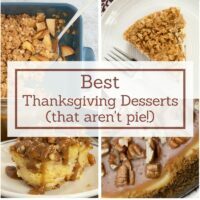 If you’re looking for even more Thanksgiving dessert ideas, be sure to see my Best Thanksgiving Pies and Best Thanksgiving Desserts. Combine the cranberries, sugar, zest, juice and water in a heavy saucepan. Bring to a boil over medium-high heat. Decrease the heat to medium-low and simmer for 10 minutes or until the cranberries are soft. Set aside to cool. Whisk together the flour, sugar, baking powder and salt. 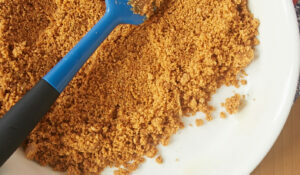 Add the butter and mix with a pastry blender or a fork until the mixture is crumbly and holds together when pinched. Set aside 1/2 cup of the mixture. Transfer the remaining crust mixture to 9-inch pie or tart pan. Press the crust firmly and evenly into the pan. Bake for 10 minutes. Then, set aside to cool slightly. Place the cream cheese and sugar in a large mixing bowl. Using an electric mixer on medium speed, beat until light and fluffy. Add the egg and vanilla, and mix until combined and smooth. Pour the cheesecake filling over the slightly cooled crust. Spread evenly. Drop the cranberry mixture by teaspoonfuls over the cheesecake filling, leaving about 1/2-inch border around the edges. Crumble the remaining crust mixture over the top of the cranberries. Bake 30 to 35 minutes, or until the edges are golden brown and the cheesecake filling is set. This sounds yummy and I’m anxious to try it. 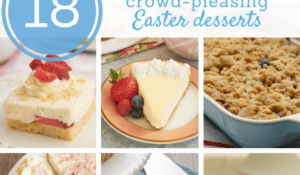 I’m extremely fond of both cheesecake and cranberries so it’s right up my alley ….. the timing is right so it just might be my Thanksgiving dinner dessert. Thanks for the creative recipe! Gosh you have me wanting to go make that RIGHT NOW. I am totally into apples and cranberries and that sounds perfect for Thanksgiving too. If I wasn’t out of cream cheese…. HAHA LOVE this one! I want to try it. Do you let it chill and serve it cold like cheesecake, or do you serve it warm like a fruit crumble? Hi, Janine. I would chill the pie and serve it cold. I’m sorry I omitted that from the recipe. It’s now updated. Thanks! Yum! Last year I made cheesecake bars using some pureed leftover cranberry sauce. I would love to have it in this pie form! It looks delicious pie-cheesecake. I am aware of all type of cakes but not aware of that type. Thanks for the sharing. I also trying this in the event. Yum! Cranberries and cheesecake, this pie looks lovely! This looks so delicious…..as do all of your recipes! Two questions….how high is the side of your tart pan and does it have to be greased? Hi, Marianne! My tart pan is about an inch deep. You don’t have to grease the pan with all that butter in the crust, but you certainly can if you’re worried about sticking. Thanks so much for your reply. Have a very happy Thanksgiving! I never really enjoyed cranberry sauce until I made my own, but to be honest I do love the cranberry flavor more in desserts than in savory recipes! 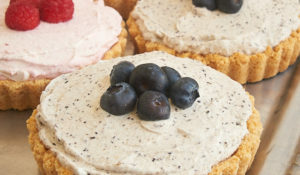 Love how the tart berries cut the rich cheesecake….a perfect bite! My only memory of cranberry sauce for Thanksgiving is with canned sauce that kept the shape of the can LOL It wasn’t until recently that I had real cranberry sauce and realized that maybe I didn’t hate cranberries after all. Wish this beautiful cheesecake pie would make an appearance right about now! In the oven now! Substituted black berries for the cranberries because my husband doesn’t like cranberries. Very excited! This is a must try! Do you think I’d be able to make this in advance and freeze it? Then when I’m in that “I want it now!” mood, I’ll be able to grab it from the freezer, thaw a few minutes and bake? Hi, Tasha. Cheesecakes generally freeze well, so I think this would be fine to freeze. Jennifer, Thanks so much for this fantastic recipe! It totally saved my Christmas dessert dilemma! The recipe I originally intended to make contained heavy whipping cream, and I discovered on Christmas morning that the cream dated Jan 11, was bad! 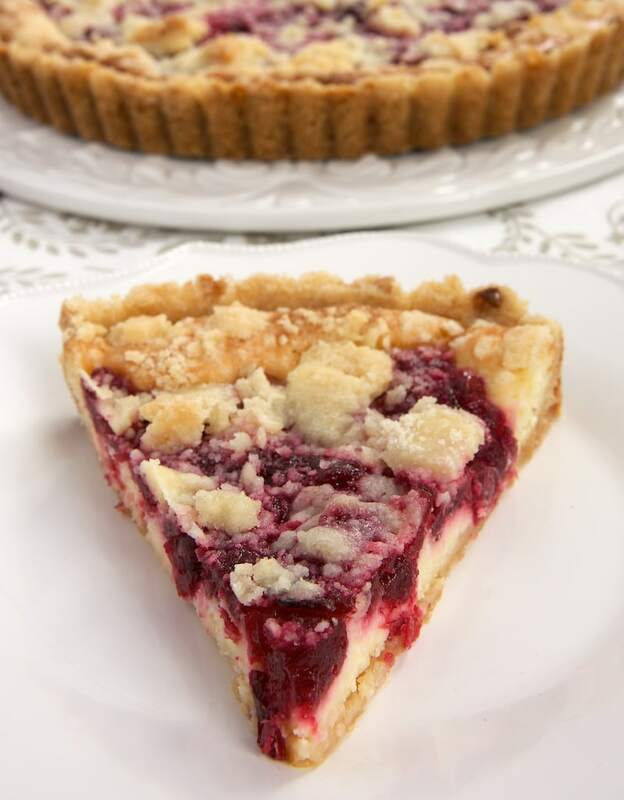 I frantically checked my ingredients, and then googled cranberries, cream cheese, pie – and your recipe popped up! It received rave reviews! I will be making many more or your recipes, and will tell all my friends!! Happy 2015! Sue, I’m so glad it all worked out for you! Happy holidays! This pie is SO GOOD!!! It’s fast becoming one of my family dinner favorites!! Thank you so much for posting this! I made this with fresh cranberries and it was wonderful. So easy to make too! Oh good lord..how did I miss this one? Has anyone tried lemon curd or maybe orange zest in the cranberry version? 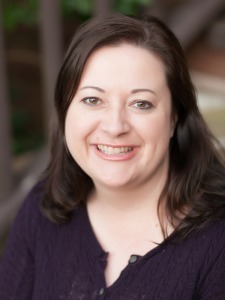 This is a must make…thanks Jennifer! Hi, Stephanie. Cranberry and orange are a great pair, so I think the orange zest is a great addition! Hi, For the 8 ounces of cranberries, is that fresh cranberries or frozen or canned? I never made cranberry anything so I’m unsure. Thank you. Hi, Sarah. You’ll need fresh or frozen cranberries. Is that 8 oz as in a cup or 8 oz in weight? My crust never came together, it seems to be missing a liquid component. Is there really nothing but the dry ingredients and butter? Hi, Anna. 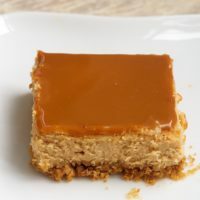 It’s essentially a shortbread, which doesn’t have a liquid component. Make sure your ingredients are measured accurately and your butter is cold. If it still won’t hold together, you can add a little bit of water (about 1 or 2 teaspoons) to help it hold together. I’m making this today and having the same problem as Anna. Ingredients measured to a “t”, but it’s powder. Add a little water until it holds together. Remember that it won’t hold together just from mixing, but it should hold together when you pinch it. Okay, I think I know what I did wrong. After the trouble with the first round, I made a different shortbread recipe and had the same problem even though it has a higher butter to flour ratio. This time I whirled the heck out of the crust mixture in the processor (about 3 times longer than I did with the first recipe) and it came together beautifully. Don’t be shy mixing the crust mixture! Would this work in a regular pie pan with a pie crust? I’ve not tried it, Nat, but I don’t see why it wouldn’t work. I don’t think you’d need to parbake the crust, though. I’m going to try later in the week. We are having a pie night and this will be my contribution. Thanks! I will have to try it as a tart sometime too but need to invest in a pan. I know this is late, but I had some fresh cranberries and was looking for a recipe to use them in. We’ve had cranberry cheese cringle before, which was delicious, so I decided to give this a shot. I can’t wait to try it! By the way, my shortbread crust worked perfectly and I subbed half superfine Almond flour for the regular flour, and half Splenda for the sugar. We’ll see how it turns out! Can’t wait to try it! my kids helped me make this! It’s in the oven and looks amazing. I don’t think it’ll make it till tomorrow for our Thanksgiving festivities! My kids are already begging for it. I made this last Thanksgiving for the first time and everyone raved about it! It’s in the oven now for the second year in a row by special request 🙂 thank you for an amazing recipe that seems to be on the fast track to tradition now! Happy Thanksgiving! That’s so great to hear, Briana! Happy Thanksgiving to you, too! I made this today but used an eight inch vintage Pyrex cake pan. It took longer to bake but turned out lovely. 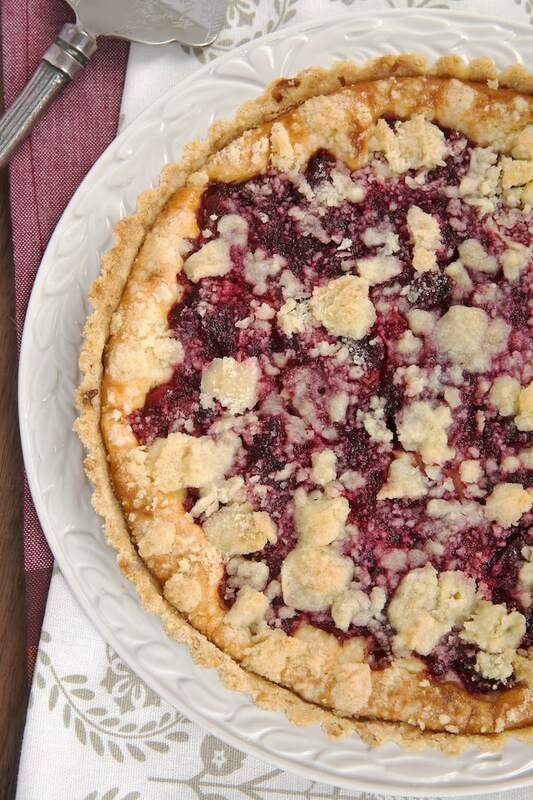 It’s more of a ” cranberry cheesecake crumble” than a pie. I made this for Thanksgiving and it was delicious! Major crowd pleaser! This recipe is soooo good! I have used lemon and orange zest, both with great results. 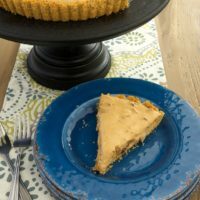 I added a little cinnamon to the crust mixture and I thought it gave it even more flavor to offset the sweetness of this pie. But as is it’s fabulous too! I’m so glad you like it, Janna! Love the addition of cinnamon! Yummy .yeah I want to make cheesecake bars.Thanks for recipe for making delicious CHEESECAKE PIE. This recipe is amazing!! Made this for Thanksgiving and everyone loved it – even folks who aren’t cranberry fans. Loved the lemon zest – all around amazing recipe. Didn’t change a thing and will def make this again – probably for Xmas! Thank you!! That’s great, Amy! I’m glad it was a hit! It sounds delicious!! Can I use dried cranberries? Hi, Monica. I don’t think the cranberry mixture won’t work well with dried cranberries. I’d use fresh or frozen. I made this for Christmas, exactly as written, using the 9″ pie pan. It was delicious! I will definitely make it again! Thanks! This was a HIT at friendsgiving! I have never been a fan of cranberries but I have changed my mind! I should have made a double batch! Everyone loved it! I’m nervous about only using cranberries since there are so many “cranberry sauce” haters. Do you think making the cranberry mixture then adding in some cherries would be a good mixture? Essentially a cranberry/cherry pie? Hi, Jill. If you like that flavor combination, then go for it. Just keep in mind that you’re adding more volume to the pie pan, so be careful that you don’t overfill it. Thank you for your reply!! Amazing of you to respond to all of us needing reviewers! 🙂 one more question – if I made this a day ahead of serving do you think the crust would get soggy? I’ve never had an issue with it, so it should be fine. Jill from my experience, a teaspoon of almond in the cranberries after removing from the stove, makes the cranberries taste like cherries. Question – do you cool the pie first on the counter before refrigerating it or go straight to the fridge with it after it bakes? Either way is fine, Tara, although I usually cool it at least 10 minutes or so until it’s cool enough to handle. If you put it straight into the fridge, you might leave a small gap in the covering so it doesn’t sweat. After an hour or so, you can cover it thoroughly. Thanks for still responding to comments! If I freeze it, should I do so before or after baking it. I’d freeze it after it has baked and cooled. Enjoy! Thanks so much! Have a happy Thanksgiving! Delicious! I highly recommend this recipe! I followed the directions exactly and it turned out great. The whole family loved it and I think it will be a new Thanksgiving standard. The tartness of the cranberries is perfect counterpoint to the cheesecake and the shortbread crust. I’m looking forward to trying variations of this with other berries. I’m so glad to hear it was a hit, Morgan! Hi, Stella. I’ve not tried freezing it, but I’d guess it would be fine. Is this recipe made in a regular spring form pan or something else? What size? Hi, Toni. It’s made in a 9-inch tart or pie pan (step 3 of making the crust). I am making this for Christmas eve (saturday). How far in advance do you think I could make it? Hi, Cora. Your best bet is to make it the day before, but if you keep it tightly covered and refrigerated, it should be good for a few days. Can I use a 12 oz pkg of fresh cranberries or should I use 8 oz as the recipe suggests. Don’t what to have leftover 4 oz. Hi, Sue. I wouldn’t recommend that. That’s an increase of 50%, and you’d get a drastically different result. If you don’t have a use for the remaining cranberries, you could make the same 50% increase in the other cranberry sauce ingredients to make extra to use for something else. I just made this pie and it turned out great! It looks beautiful too. I made one addition. I chopped up one apple and added it to the cranberry mixture. I did not use all of the mixture when I put together the pie. My husband plans to use the rest to top his oatmeal. Thanks for the wonderful recipe! I’m so glad you liked it, Lisa! Can it be refrigerated for more than 24 hours? Yes, it should keep in the refrigerator for a few days. Made this last Christmas and came across the recipe again while browsing Pinterest. Turned out great – will make again! I’m glad you liked it, Sarah! Thanks for this delicious pie whichI made recently and received very good comments on it. It was so good that I want to increase the size to 10 inches pie, do I increase the portions by 1.5 or 2? Hi, Regina. Changing from a 9-inch to 10-inch pie pan only increases the volume about 18%. You wouldn’t really get a lot more pie out of that. If you’re looking to double, then I’d either make two pies or maybe try a shallow 9×13 pan. I don’t have a 9” tart pan but I have a 10”. Do you think it would be okay for this recipe? Hi, Paula. It will obviously be thinner, so I would keep an eye on the baking time. It may need a little less time to get done. Also, the crust will be thinner, so you may want to add more to it and sacrifice some of the topping. This recipe looks amazing. Would it work to make it the day before Thanksgiving and keep in the refrigerator? Hi, Amber. Yes, it should keep for a few days tightly covered and refrigerated. I’m so excited to make this recipe for thanksgiving this year! 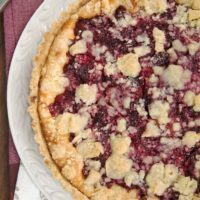 Could I use a ceramic pie pan rather than a aluminum tart pan? Will there be a difference in baking times, which is safer? Hi, Madi. A pie pan should be fine without altering anything. I just find that it’s a bit harder to serve this neatly and cleanly from a pie pan versus a tart pan. 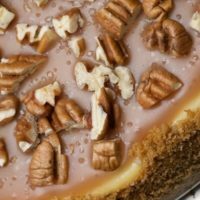 Wondering how to scale down the crust recipe to just use for the topping. I want to use a refrigerated pie crust for the bottom. I would do 1/4 of the crust recipe for topping only. Hi, Corie. I’d guess you’d need about 1/3 of the recipe. 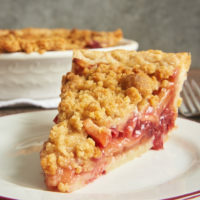 Or you can just use a crumb topping recipe from a pie recipe you like. Hi Jennifer – made this yesterday but used a rectangular tart pan with removable bottom. It was delicious as are all your recipes! That’s great to hear, Paula! I don’t use my rectangular tart pan nearly enough. I love the way it looks! I thought I had baking powder. Would baking soda work? I’m assuming that I need to run to the store. I would use baking powder if at all possible. Baking soda is about 4 times stronger and usually needs an acidic ingredient present to activate it. If it were me and couldn’t get baking powder, I’d make this crust without it before making that substitution. I’m going to send my husband to the store. Thank you! So excited to make it. My brother and I do a bake-off every Thanksgiving and this year’s signature ingredient was cranberries. I chose this recipe and I WON! I made it in a tart pan and it was perfect — looked exactly like the photos on here. The shortbread crust and crumble topping was so crisp and flavorful, even after being frozen (I made it a week in advance). I added cinnamon and vanilla to the cranberry topping, and only used about 2/3 of the prepared topping on the tart itself, but otherwise I followed the recipe exactly! Thanks so much for a delicious recipe! I’m thinking of trying it again with raspberries or cherries! If I am using leftover cranberry sauce that I made for Thanksgiving, do you know how much I would use? I’d guess about 1 & 1/2 cups. I made this a year ago, and it was pretty dang good. I used an almond flour shortbread cookies recipe for the crust. This time trying it as a true cheesecake in a springform pan. Is it going to hold up? Hi, Nate. If the only change is making it in a springform pan, then I don’t think there should be a problem. I had to double the filling, but it worked out marvelously. Great! Thanks for letting me know how it worked. I want to use a springform as well. Should the crust be doubled as well as the filling and how much time to add to the baking time ? I wouldn’t think the crust would need to be changed if your pan has a 9-inch diameter. As for the baking time, if you’re making it thicker, it will definitely need to bake longer. As I’ve not tried it, I can’t say definitively how long it will need. You’ll just need to use your best judgment. If it were me, I’d add 10-ish minutes and then check for doneness and add more time if necessary. I have made this for Thanksgiving the past two years & my family loved it! So much so that I’m making it again for a work holiday party & for Christmas! Thanks so much for sharing this deliciousness! That’s wonderful to hear, Jen! Merry Christmas!